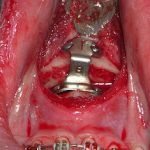 Background: While augmentation of the lower jaw has historically been perceived as that of the chin at the front of the jaw, that has been a limited perception of what is possible and often needed. Augmentation of the back of the jaw, the jaw angles, affects two-thirds of the lower jaw and can have just as much aesthetic significance in some patients. 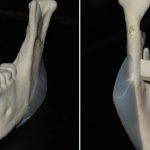 While jaw angle implants have been around for over twenty-five years, they have always been a distant cousin to the chin implant in terms of clinical implantation. This is because of a lack of understanding of jaw angle aesthetics, diagnosis, and limited implant options. The lateral or widening jaw angle implant was the original implant design. And while that is still a useful implant style, it is not effective for all jaw angle deficiencies or augmentation needs. Case Study: This middle aged male wanted a more masculine lower jaw. He had good chin projection but had lack of fullness to the lower posterior face and no discernible jaw angles. He opted for using standard vertical lengthening jaw angle implants. Under general anesthesia and through intraoral posterior vestibular incisions, superiosteal dissection was done around the jaw angles. Then careful and gentle dissection was done to elevate the soft tissue off and around the inferior border from the jaw angle point anteriorly to the front edge of the masseter muscle. The jaw angle implants were inserted with attention to making sure the actual angle of the implant fit over the inferior border of the bone. Percutaneous screw fixation secured the implants to the bone. His before and after pictures shows the significance of adding some length and width to this existing jaw angles. 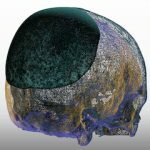 1) Vertical lengthening jaw angle implants are one type of jaw angle implant style that can creates a combined vertical and width augmentative effect. 2) It is not uncommon to have perfect symmetry between any type of standard jaw angle implants that are placed. 3) All jaw angles implants require screw fixation particularly those that extend the borders of the bone inferiorly.